The GB Sport is shaped to compliment the modern day truck body with its advanced aerodynamic architecture. 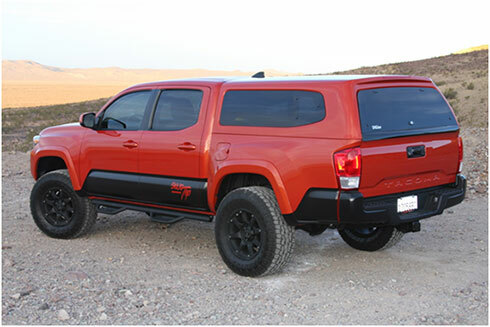 Sleek scallop windows and third brake light spoiler add to this state-of-the-art design. One piece fiberglass construction with honeycomb insulated roof. Finished edge with built-in rubber bottom seal for water-tight security. Painted to match vehicle using DuPont Chroma/Premier basecoat/clearcoat. 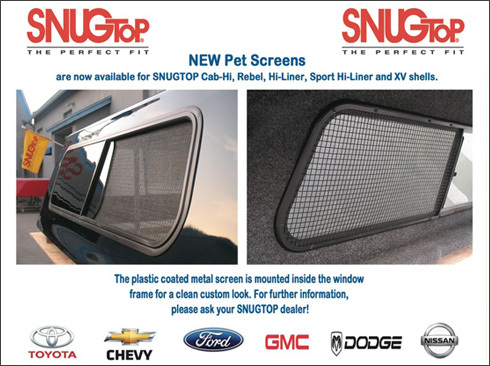 Exclusive hidden mounting system (no holes) for easy installation/removal. 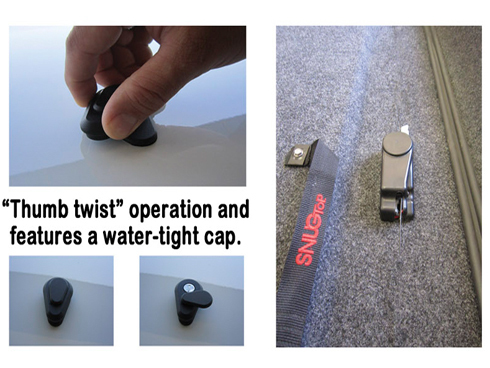 Key-operated EZ-Open lock fits flush with door and pops the tailgate open when turned. Choice of 12v or battery-operated interior lighting. Featuring Advanced Structural Composite construction and additional roof reinforcement, the Outback can carry up to 500 lbs. of gear in optional racks. This enables the owner to equip the Outback for a variety of recreational activities that include kayaking, sailboarding, canoeing, surfing, skiing, snowboarding, bicycling and camping. 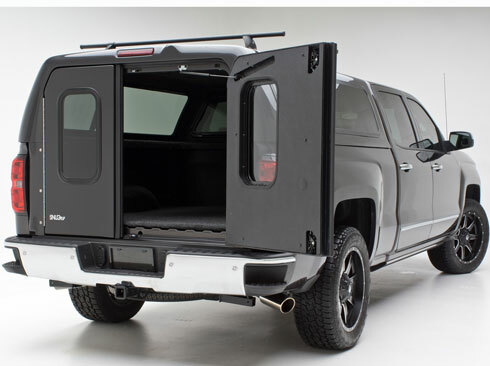 Key-opertaed EZ-Open lock fits flush with door and pops the tailgate open when turned. Integrated LED third brake light with choice of 12v or battery-operated interior lighting. 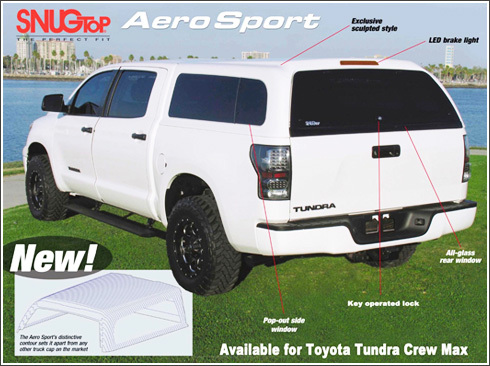 Optional roof rack with accessories for carrying bikes, kayaks, snowboards, etc. Backed by a limited LIFETIME WARRANTY on construction and finish. 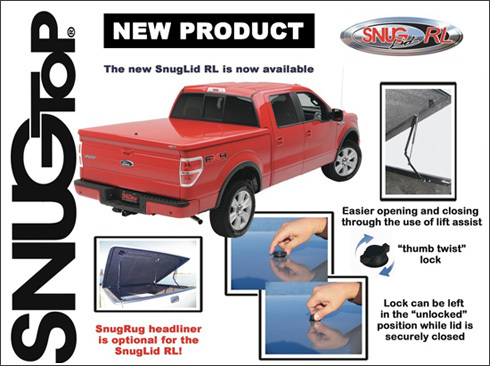 SNUGTOP introduces the next generation Snuglid sl with complete redesigned hardware. 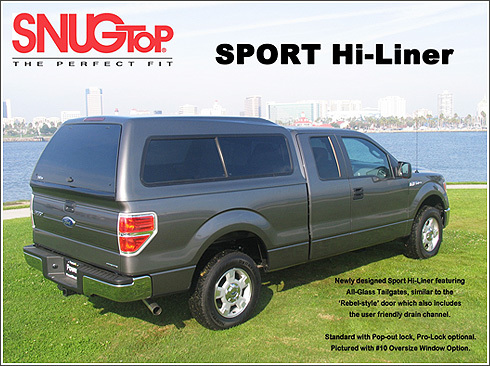 Along with extra headroom, the new Hi-Liner also features and all glass tailgate. 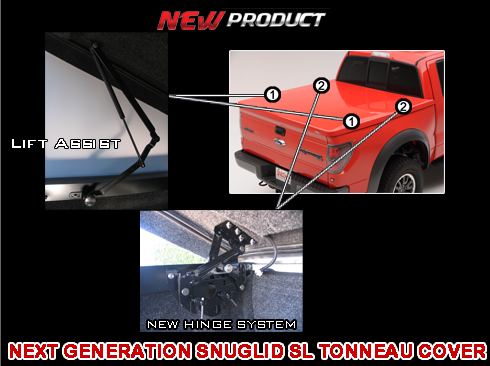 Exclusive Hidden Mounting System firmly holds the cap in place without drilling holes in the bed for easy removal and installation. Laminated Hinges and Hardware which provide an extra measure of safety, not to mention maximum strength. 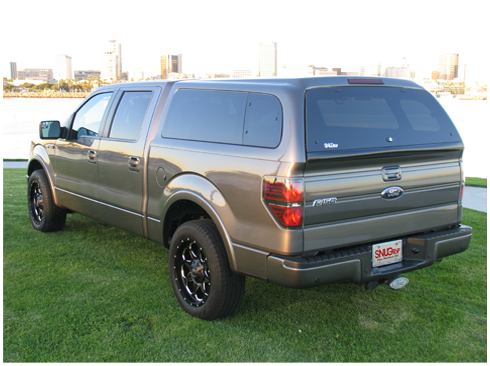 All-Glass Tailgate with user friendly drain channel. Plastic coated metal screen is mounted inside the window frame for a clean custom look. The lock can be left in unlocked position to allow frequent access without requiring the use of a key. Single key lock rotary latching system for quick open and close. Lift assist for easier operation. 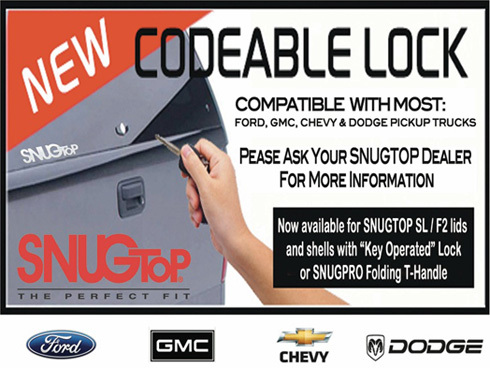 Now Available for SNUGTOP SL/F2 lids and shells with "Key Operated" lock or SNUGPRO folding T- Handle. Compatible with most Ford, GMC, Chevy and Dodge Pickup trucks. The new “Tear-Drop” lock is optional available with new remote lock & unlock system using the vehicle remote (same as PRO-LOCK). “Thumb twist” operation and features a water-tight cap.